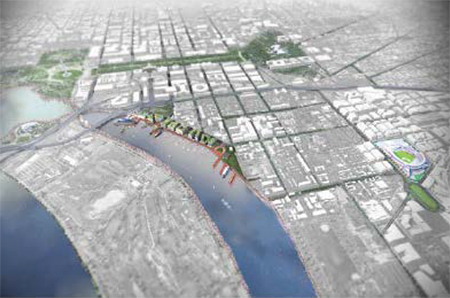 The Southwest Washington Waterfront is a large-scale redevelopment effort totaling over 2.4 million square feet of mixed-use development. The project site, located on a mile-long stretch of waterfront along the Washington Channel at the convergence of the Potomac and Anacostia Rivers, includes 27 acres of land and 49 acres of riparian rights. Upon completion the Southwest Waterfront development will include approximately 500 marina slips, a below-grade parking garage, and 10 acres of parks, open space, and promenades. As planned, the Southwest Waterfront will be the first LEED-Silver certified mixed-use project in the District. Because of its scale and location, the project is intended to be transformative, catalyzing additional investment along the District’s waterfront. The project will be delivered in multiple phases, with total investment of approximately $2.2 billion. Construction of the first phase, which includes almost 800 residential units and over one million square feet of commercial development, commenced in 2013 and is expected to be complete by 2017. Subsequent phases are expected to be completed by 2022. At full buildout, the project will include approximately 1,350 residential units, three hotels (with approximately 675 keys), 975,000 square feet of Class-A office development, 340,000 square feet of retail and restaurant, and a 150,000 square foot concert and convention hall. Since inception, this project has involved public participation. 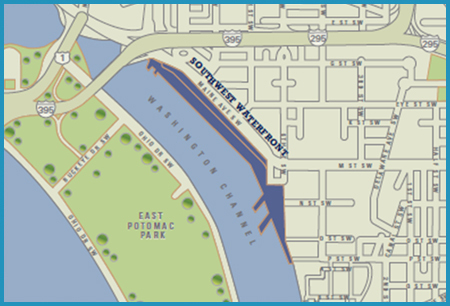 In 2000, the District of Columbia launched the Anacostia Waterfront Initiative, which brought together more than 20 different Federal and District agencies that hold land or jurisdiction along the Anacostia River. Resolving title and air rights issues required federal legislation signed by the president. 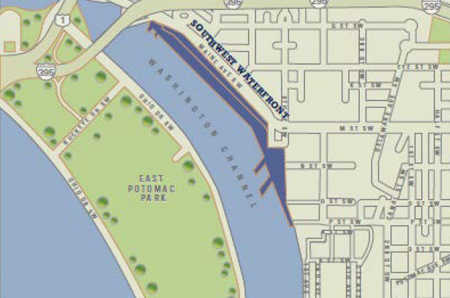 In 2003, the D.C. City Council approved the Anacostia Waterfront Framework Plan. 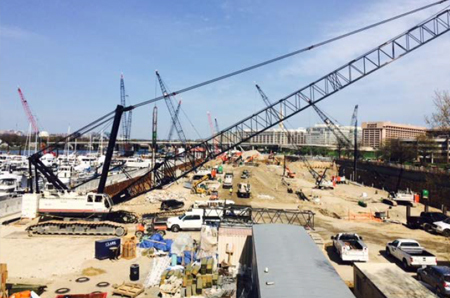 In 2006, Hoffman-Madison was selected to be the master developer of the Southwest Waterfront. The District and December subsequently executed a term sheet for a $198M public finance subsidy. The Southwest Waterfront Project will be funded by sources of debt and equity, including private construction loans, collateralized land loans, and funding from Hoffman-Madison and institutional partners. TIF/PILOT bonds in an amount not to exceed $198 million will be issued to finance public infrastructure improvements, including parking, roads, piers, and parks. The proceeds from the sale of the bonds will include the cost of the public improvements, issuance costs, and interest on the bonds during the capitalized interest period. Security for the TIF and Special Assessment bond includes PILOT payments, incremental sales tax revenues, and, if necessary, special assessments levied on property owners within the development. In the event that revenue from these sources is insufficient to pay debt service, revenues from the Downtown TIF District will be made available. On September 3, 2015 the District of Columbia issued the first of multiple series of TIF/PILOT taxable bonds in the amount of $145,445,000. Net proceeds amounted to $113,000,000 available for the project. The TIF/PILOT bonds were issued with the highest ratings in the District’s history for a comparable bond rating. MuniCap has been retained to provide guidance in structuring and implementing the plan of finance on behalf of Hoffman-Madison, the master developer.